Pollution isn't just an unfortunate fact of modern life -- it is a killer. In fact, pollution is linked to about 9 million deaths each year -- three times as many deaths as AIDS, tuberculosis, and malaria combined -- according to a new large report published in The Lancet. It says pollution played a role in one in six of all deaths across the globe in 2015. The majority of these pollution-related deaths are due to non-communicable diseases caused or exacerbated by exposure to pollution, including asthma, heart disease, stroke, lung cancer, and chronic obstructive pulmonary disease (COPD). The report is a culmination of a two-year project that brought together more than 40 international health and environmental experts as part of The Lancet Commission on Pollution and Public Health. "Pollution is much more than an environmental challenge -- it is a profound and pervasive threat that affects many aspects of human health and wellbeing. It deserves the full attention of international leaders, civil society, health professionals, and people around the world," the commission's co-leader, Professor Philip Landrigan of the Icahn School of Medicine at Mount Sinai in New York City, said in a statement. The report found that biggest contributor to pollution deaths was air pollution. That included both indoor pollution -- resulting from the burning of wood, charcoal, coal, dung fuel or crop wastes -- and outdoor, comprised of gases and other contaminants. Air pollution was associated with 6.5 million deaths in 2015. The authors based their estimates on data from the Global Burden of Disease study, coordinated by the Institute for Health Metrics and Evaluation. Water pollution was the second biggest threat, linked to 1.8 million deaths that year, as a result of gastrointestinal diseases and parasitic infections. Workplace-related pollution, including exposure to toxins and carcinogens, was associated with 800,00 deaths. These cases included deaths caused by diseases such as pneumoconiosis in coal workers; bladder cancer in dye workers; and asbestosis, lung cancer, mesothelioma, and other cancers in workers exposed to asbestos. The greatest numbers of deaths due to pollution in 2015 occurred in India with 2.5 million, followed by China with 1.8 million deaths. 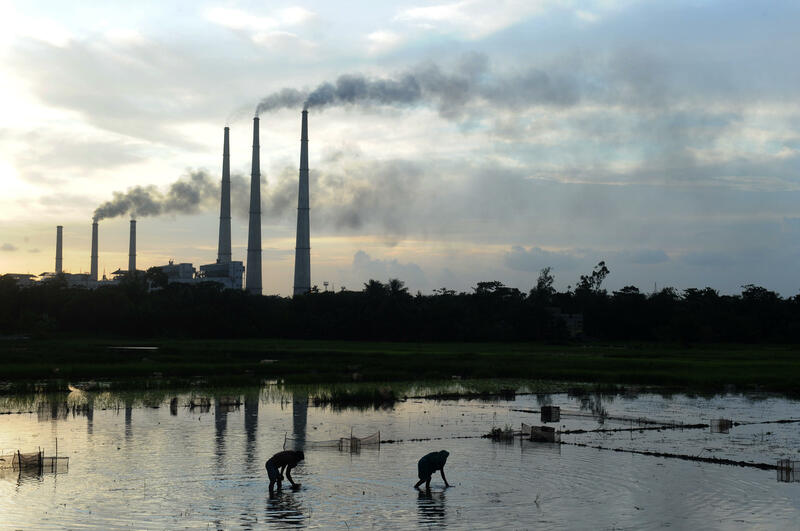 The vast majority of pollution-related deaths -- about 92 percent -- take place in low- and middle-income countries, but countries that are currently undergoing rapid development and industrialization are most affected. For example, in India, Pakistan, China, Bangladesh, Madagascar and Kenya, pollution is responsible for one out of every four deaths. The findings also show that the economic cost of pollution-related health issues is tremendous. Welfare losses due to deaths and disease linked to pollution amount to approximately $4.6 trillion each year. The report outlines strategies to help reduce pollution and lessen the toll it takes on human health. "Solutions exist. There are well-tested, low-cost strategies that work to keep pollution in control," commission co-chair Richard Fuller told CBS News. Fuller is president of Pure Earth, international non-profit organization dedicated to solving pollution problems. Elevate pollution as a national and international priority, and integrate it into country and city planning processes. Increase funding for pollution control and prioritize by health impacts. Establish systems to monitor pollution and its health effects. Build partnerships for pollution control. Address pollution as part of efforts to reduce non-communicable diseases. Continue research into pollution's impacts and pollution control. The authors are optimistic that, despite the huge challenges, changes can and will be made to address the problem. "This report is a show of force," Fuller said. "It represents a coming together of all the top minds thinking about pollution, its impact and solutions, and saying enough is enough. We are united in our agreement that pollution is a global crisis and that we can solve it. The world has to listen." Writing in a linked editorial, Dr. Pamela Das and Dr. Richard Horton of The Lancet say the report should "serve as a timely call to action." "As the report shows, no country is unaffected by pollution," they write. "Human activities, including industrialisation, urbanisation, and globalisation, are all drivers of pollution." They say they hope the commission's findings will inspire action by business leaders and persuade politicians "at the national, state, provincial, and city levels to make pollution a priority. Although there is some activity on pollution internationally, much more is needed. ... Pollution is a winnable battle."